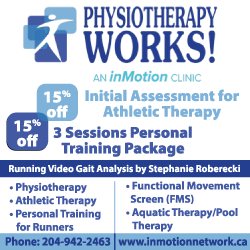 The MRA is always excited to introduce a new Discount Sponsor to our members and today we are pleased to welcome the inMotion Network. The inMotion Network consists of multi-disciplinary clinics that are spacious and modern with state-of-the-art equipment. Their clinicians have extensive post-graduate training providing high standards of care consistent across our locations and services.The inMotion Network takes pride in evidence-based practice and a commitment to our referring sources and patients to establish effective preventative programs and individualized service and care to expedite injury recovery. MRA MEMBERS receive an exclusive 15% off Initial Assessment for Athletic Therapy and 15% off 3 sessions personal training package. Click to visit the the inMotion Network today!